Humans have been sending fish to space since the 1970s. Fish were the first vertebrates to mate in orbit as of 1994. In 2012, group of Japanese rice fish, also known as medaka, journeyed to the International Space Station, not to breed or pilot any sort of seafood farming for future astronauts, but to act as a convenient stand-in for humans as we learn about microgravity. Like humans, the fish seem to be adversely affected by living in low gravity, and they conveniently start displaying symptoms almost immediately after entering Earth’s orbit. Even better, medaka (Oryzias latipes) are basically translucent, making it easier to see what’s happening in their bodies as it happens. Even though fish are separated from humans by millions of years of evolution, they share some fundamental biology with us, such as the mechanisms that recycle and create new bone tissue. Medaka also handle being transported well, spawn lots of offspring and have been studied extensively from various angles, making them a handy model organism for finding out how living in space affects a vertebrate’s bone development. We’ve known that living in microgravity can reduce bone density for some time, but the fish react very quickly to their new environment, so it’s possible to observe these changes in a practical time-frame, instead of waiting months or years to see results. The fact that medaka have mostly translucent skin makes monitoring their bodily functions helped as well, but scientists wanted to go a step further to get the data they needed. This batch of astro-fish were genetically modified so that two types of cells associated with skeletal development would fluoresce under specific colors of light. This way, scientists could choose a specific light to watch these cells’ activity in the translucent bodies, all without disturbing the fish any more than necessary. This was also handy for the astronauts on the ISS, who are generally too busy to be doing vivisection studies of tiny fish in microgravity. The cells in question were osteoclasts and osteoblasts. Osteoclasts break down bone tissue that needs replacement or repair, whereas osteoblasts build the framework for bone cells to grow on. 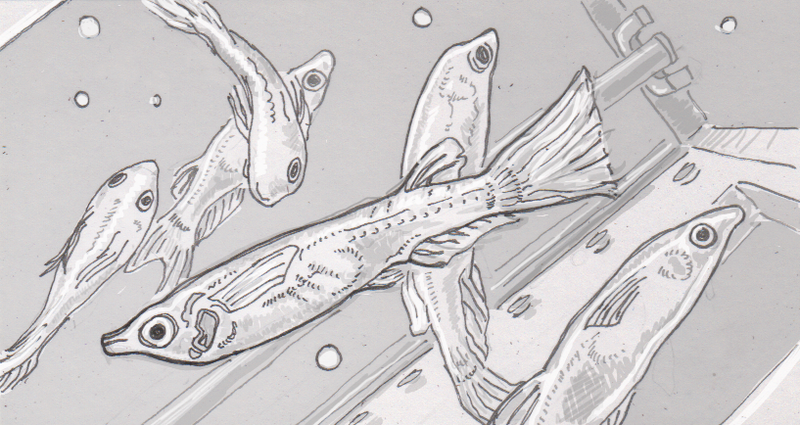 Unlike humans that take around 10 days to show any difference in bone development, the medaka fish kicked both types of cells into high gear from the start. Over the course of a week, the genes that govern these cells behaved significantly differently than on Earth. This experiment may help target future research, as the fish will likely be good models for a variety of future experiments, even beyond the regulation of bone tissue. My kids asked: What happens to the fish now? Are they left in space? These medaka can normally live for around a year in the wild, but they didn’t have that much time on the ISS. Their special tank was designed to handle feeding, temperature control, simulated day and night-cycles of light, plus monitoring equipment for scientists on Earth to observe their experiment. However, these deluxe accommodations only had filtration systems intended to last 90 days, so a full year in space wasn’t in the cards. That was probably enough time for the fish to mate and spawn though, possibly for as many as three generations of medaka. Astronauts obviously didn’t flush any dead fish down their specialized toilets, but the medaka probably didn’t make it back to Earth either. That’s not to say that no animals ever return to their home planet, as a batch of zebrafish were safely brought back from the ISS in 2016… most likely to be dissected.